Whether you have a space restrictions, the need for another back up power, a unit to control hydraulic for the entire plant, a harsh environment or a food safe washdown environment, we can find the solution to fit your requirements. We have built many types of power units with a wide range of options over the years. Click through this page to see some solutions from the K.R. West design team. 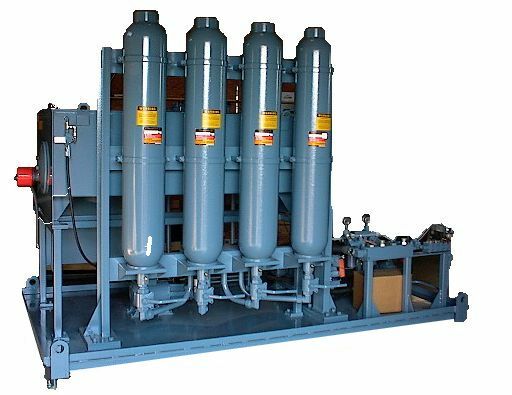 This unit incorporates a FRL (filter, regulator, lubricator combination) which sends air pressure downstream to an air cylinder booster. 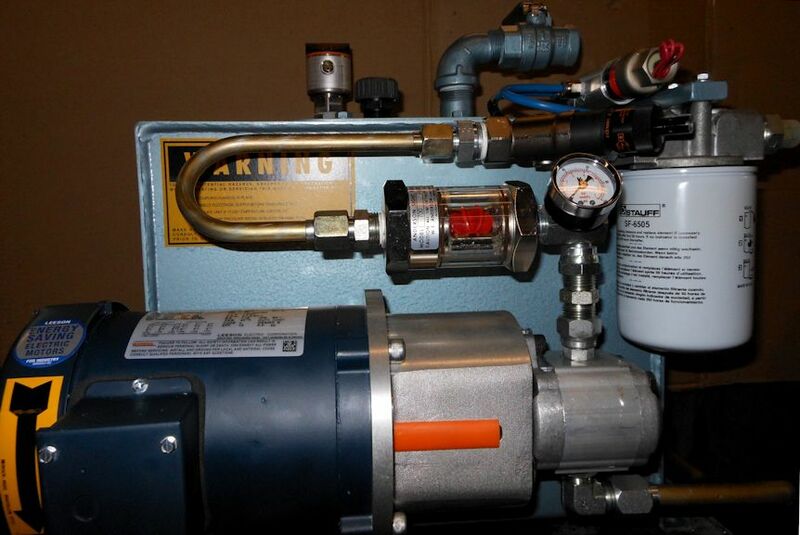 The air cylinder pumps hydraulic fluid downstream with a needle valve controlling the flow. This unit is about a foot and a half squared for a compact size. It was built as a set of two. This unit was built to power the hydraulics of a cheese proccessing factory. The factory had limited floor space, but amble vertical space. 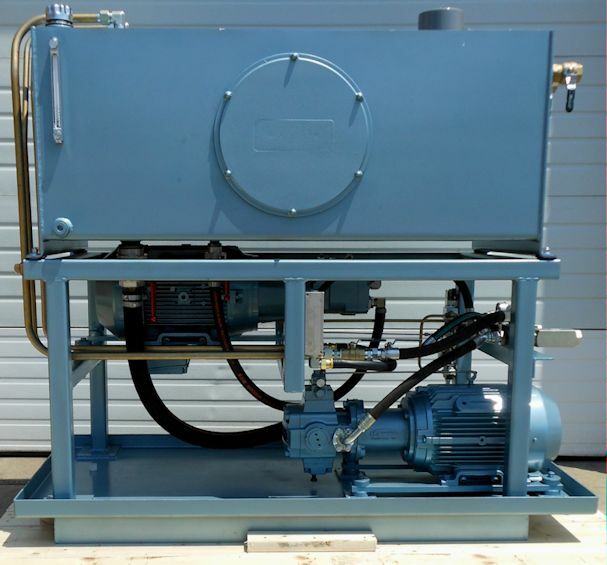 This large custom power unit includes a lot of great features. 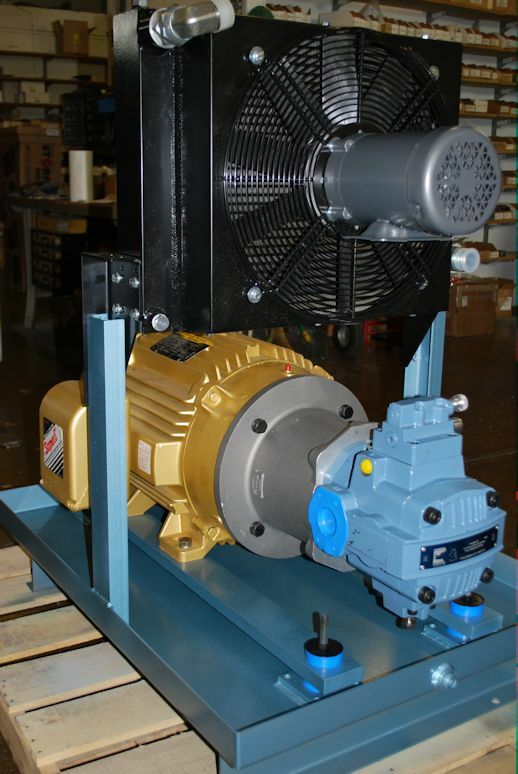 Four Coninental PRV50 vane pumps are mounted with noise dampening mounts. The PVR50-70B15 have a capacity of 70 gallons per minute each. There are spaces for two more pumps if needed, which would put total maximum flow at 420 gallons/minute. The unit is designed so the operates can turn on one pump at a time to save energy with the help of a 350 gallon per minute turbon flow meter to cylcle pumps on demand. Low profile flange mount suction ball valves are used to allow or stop flow. Along with noise dampening motor mounts, there are noise supressors in the power lines, making this large power unit relatively quiet. A kidney loop filter cooling system prevents excessive heat. Two point programable level, temperature and pressure switches are used to ensure the unit operates correctly. A custom design PLC system with a 7” color HMI allows easy control of this powerful unit. The unit was built with the fabrication help of Basset Mechanical. The stainless steel power unit is safe for washdown and can be controled with a four button pendant. The unit is being used to power the hydraulics on a large paper roll machine. 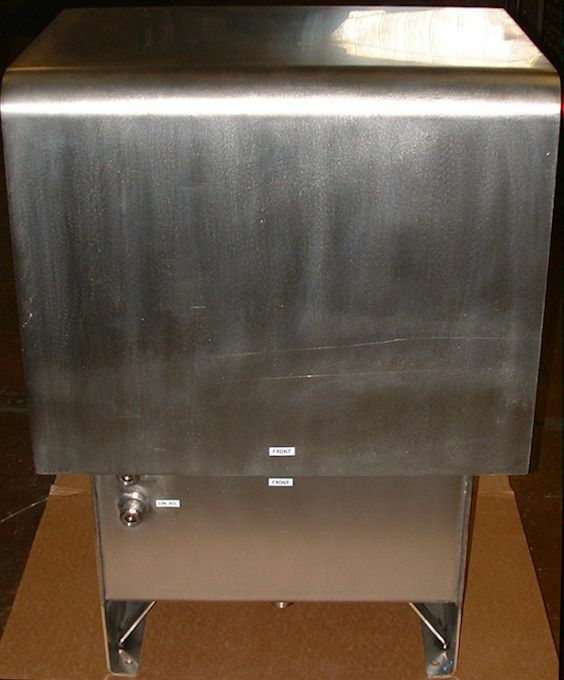 This stainless steel hydraulic unit was built for cheese plant block processing in a brine area chemical wash-down with a high humidity environment. The stainless steel parts included are a 316SS reservoir and washdown hood cover, 316SS vertical motor/pump adaptor, 316SS motor/pump coupling access above top, and a 316SS custom valve manifold. Also included in the unit are Wandfluh 22mm relief cartridges, Wandfluh D03 (NG6) directional valves, Wandfluh D03 (NG6) Sandwich 3 way bypass flow controls, Continental D03 Sandwich counterbalance valves, Des-Case reservoir desiccant breather, Stauff return line filter, Baldor 5 HP washdown duty motor, and a submersed double gear pump. The unit has two independent control circuits. 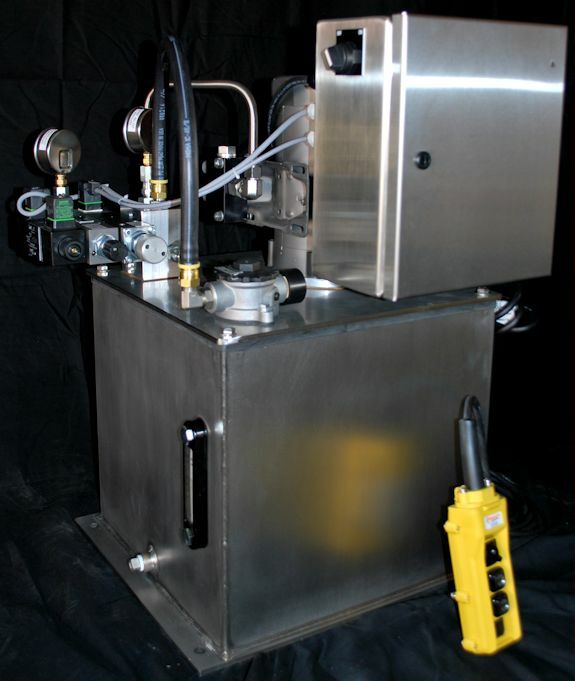 Hydraulic power unit incorporated on a machine frame; includes 10 Enerpac block cylinders used to punch holes in metal. Application is heavy production cycles, and rapid oil delivery was needed at 2500 psi. Cycles are controlled by customer supplied two-hand anti-tiedown pneumatic loop, that powers a pump mounted DO3 air piloted directional control valve. 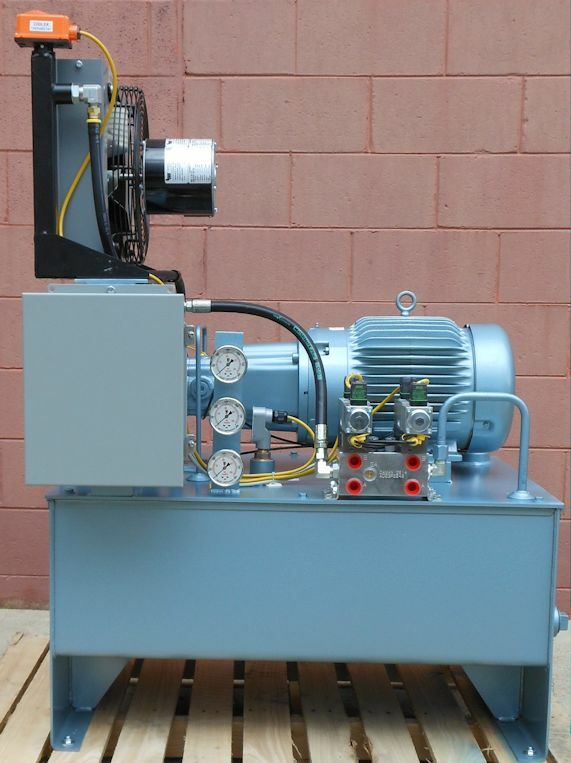 This l-shaped power unit has a two vane pumps and two motors. 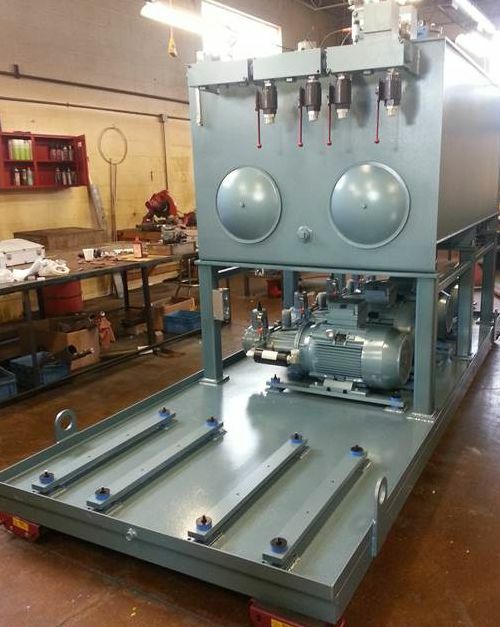 This unit will be used as a paper rewinder hydraulic supply. 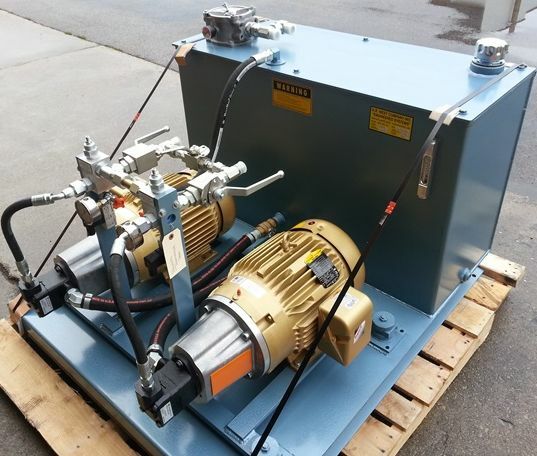 This power unit will be used as a hydro gate positioner. It incorporates electrical controls and also has an emergency shutdown built-in if the dam would ever lose power. This unit was built for a hydro bearing lube system. It includes an IFM Efector level switch and transmitter, an IFM Efector flow switch, and an electrical differential switch. 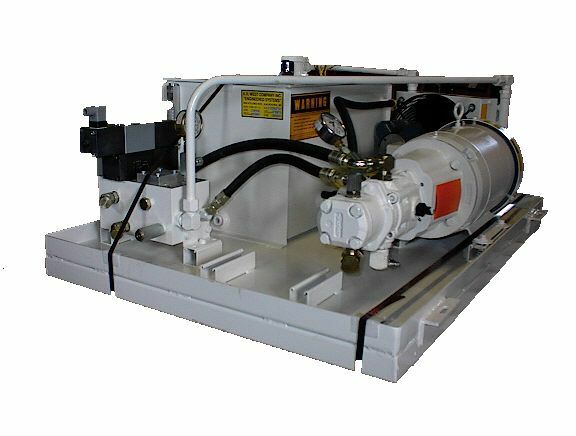 This is a tandem pump hydraulic unit that was designed for the customers space needs. Their height requirements for where this power unit would be placed were limited. 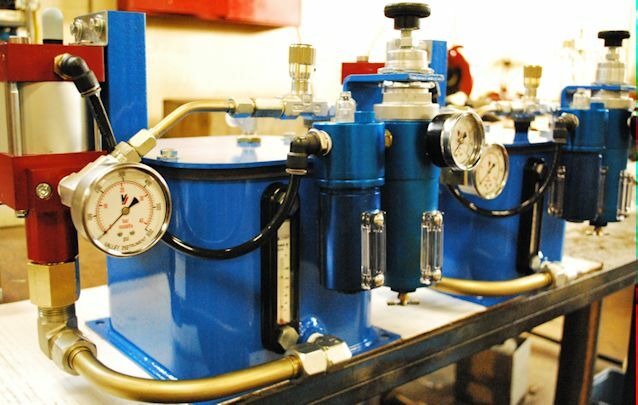 This is a low profile hydraulic unit that was designed and built to fit under an Amplus Manufacturing bag machine. This allows for necessary floor space to be free that a taller unit would have used. The design incorporated a Wandfluh softshift valve to eliminate shock in the valve and cylinder circuits. Also incorporated was a Continental Hydraulics variable volume pressure pump, which compensated to reduce horsepower and cooling needs. 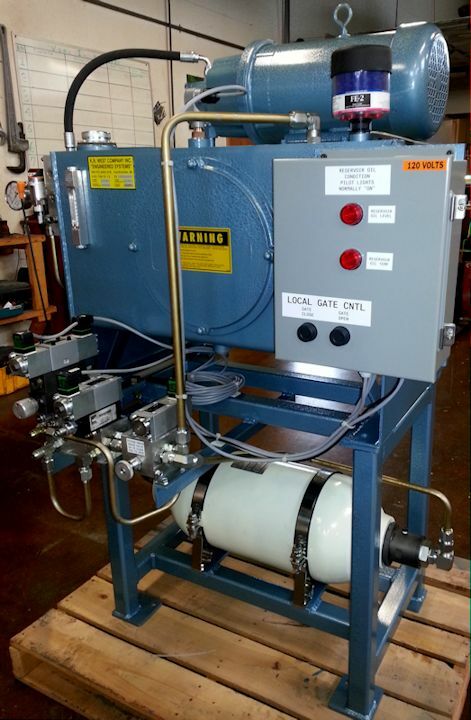 This hydraulic power unit was built from stock components in 3 days. 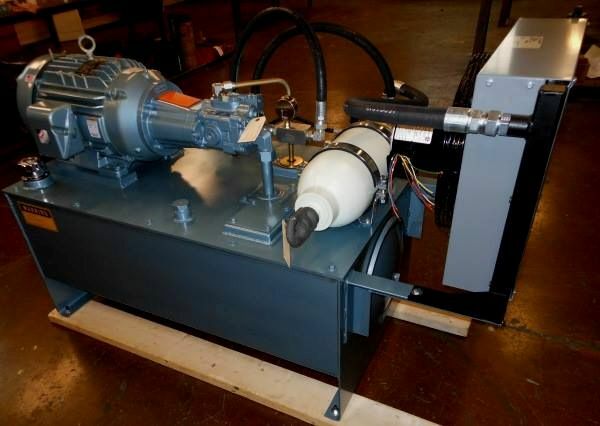 It includes a pre-charged accumulator, air driven fan cooler, high pressure piston pump, and a KRW-5010 spin on filter. 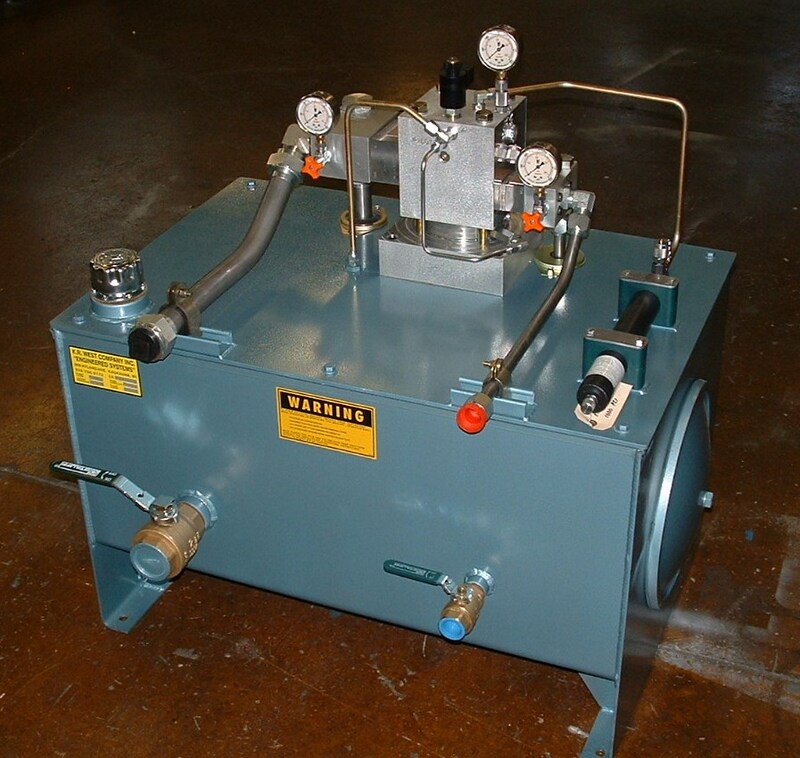 This power unit includes a Continental pressure compensated vane pump, piggyback 4-1/4 GPM recirculating cooler/filter pump, Stauff pressure line and recirculating filters, Stauff test point system, Wandfluh duel channel amplifier for independent reducing valve control, Wandfluh proportional pressure reducing valves and directional control valves, Murr connectors, Thermal Transfer air/oil cooler and electrical junction box for customers’ connections. 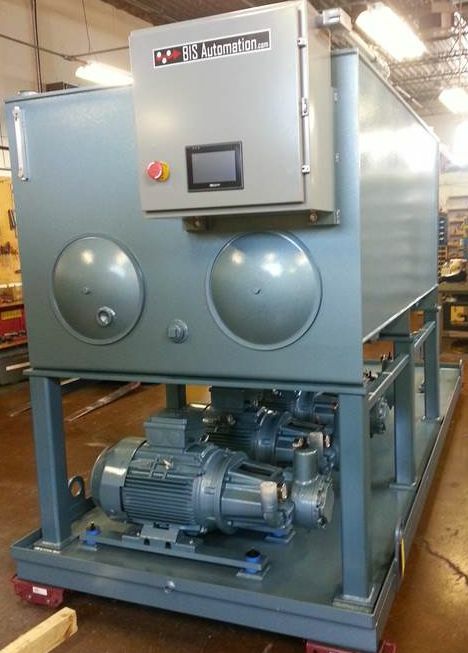 This power unit has added pumping and cooling capacity for more system capacity. It has an isolation mounting with rubber mounts for a quiet pump noise. The tank will sit next to this power unit. 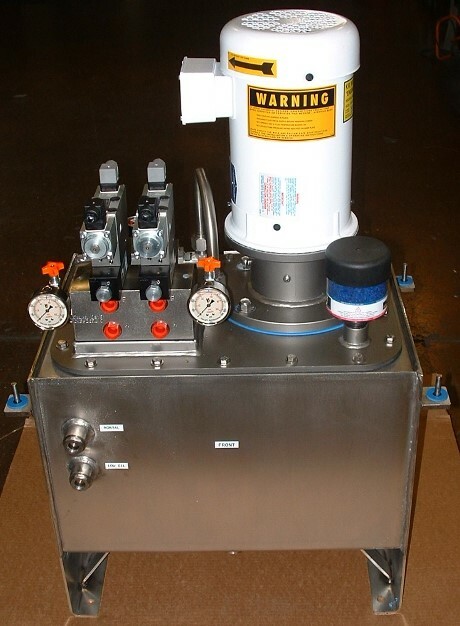 This power unit incorporates high/low pump controls and a pre-fill valve. The unit also has a small accumulator for emergency pilot pressure. We have the ability to simplify complex systems. 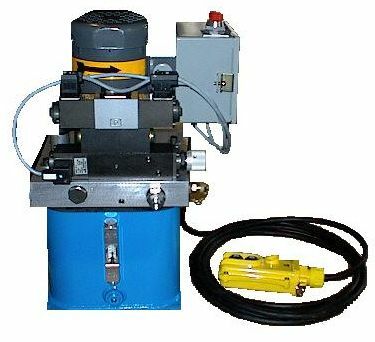 This small compact hydraulic unit is used for a Milwaukee Cylinder power arm and power lift. The valve incorporated is a Wandfluh Proportional valve to create smooth operation and allows multi-speed lifting for heavy parts. This compact unit has a 2 gallon reservoir, 1 HP motor, 2 GPM pump, Directional valve, Pilot check valve and a two speed control. The dimensions are 12" x 12" x 20". This hydraulic system was built to control the gates of a dam for power generation. The accumulators allowed a high flow as needed and quick operation on the gates in case of emergencies. Wandfluh proportional control valves were incorporated in the design for accurate positioning of the gates. Continental pressure compensated pumps were also incorporated to allow for low horse power and to keep the energy use low.